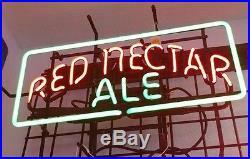 Up for sale a vintage Red Nectar Beer neon sign. The sign is in excellent condition and is roughly 26″ x 15″. The item “Red Nectar Beer Vintage Neon Sign” is in sale since Saturday, February 20, 2016. This item is in the category “Collectibles\Breweriana, Beer\Signs & Tins\Other Beer Signs & Tins”. The seller is “sonomamancave” and is located in Windsor, California. This item can’t be shipped, the buyer must pick up the item.